Right after posting my blog offering yesterday, the one in which I urged some reflection on the trend, everywhere apparent, to replace human beings with machines, I opened up The New York Times to find an opinion piece by Stacy Torres, who pretty much echoed my argument. Torres is an assistant professor of sociology at the University at Albany, and her piece in the June 23, 2017, edition of The Times was entitled: "Save America's Cashiers." I agree with Torres when she says, "No one really wants to buy groceries from a robot." 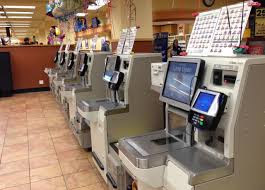 Torres also documents how the human interactions that occur at the checkout counter provide a kind of interactional "glue" that can help hold us together, socially, and that can be of great importance to particularly vulnerable individuals. I certainly recommend her article. Good sociology, however, will not necessarily prevail, as long as we delegate decisions about our economy to the corporations that own and control capital. This is our current system, and as events make clear, human beings will be deleted from the equation whenever possible, because that will save money. And, to be honest about it, there is a good argument that economic "efficiency" is a worthwhile objective, in many situations. We just need to think about "efficiency" from a larger, whole systems perspective. How "efficient" is an economy that reduces human interactions (and eliminates jobs) when the impact of this economically driven transformation results in thousands of homeless persons, living on the streets? Make no mistake, replacing humans with machines does deprive the replaced humans of the income that they need to pay for their expenses, and we don't have much of a "safety net." What we do have is disintegrating around us, too. Rather than trying to impose democratic, community control over what are now private economic enterprises (a good idea, "theoretically," as Marxists have always contended, but not an idea that has proven very successful in real life), I'd like to suggest another way of dealing with the issue. We assume that our economy is supposed to be based, virtually entirely, on private economic activity. That "capitalism" model has produced some very positive results, too, along with the problems, some of which have just been discussed, above. But why should we assume that we can't have "public" economic activity, as well? In the health care field, many are starting to think that "self-insurance" is the way to go. Usually, that comes out as "single-payer," but the key idea is that we, as a society, are "in this together," and that since everyone's health is incredibly important, both to individuals and to society as a whole, we should, collectively, decide that we will simply "insure ourselves." If any one of us has a health problem, the community at large will pay for necessary care. In fact, that is the lowest-cost and most stable kind of health care system possible, looking at things from an overall perspective. All that is needed is funding, and there are lots of corporations, and individuals (that 1% crowd), that have the wherewithal to provide the necessary financing for a system of healthcare based on the "self-insurance'"principle. Our nation did, in fact, adopt exactly this approach during the Great Depression. The effort was overseen by a federal agency, the Works Progress Administration, and the system worked, too, until waging World War II absorbed all our excess labor supply. Nowadays, even military spending isn't really filling the bill! Of course, this "self-employment" idea would only work if we, collectively, had the money to pay for the work that we would be commissioning. The system, like self-insuring for health care, would require funding, but that's where those 1% folks come in. They've got lots of money, generated from the economy of which we are all a part. Those 1% folks have to be good for something, don't you think? How about funding work for everyone, that makes our collective lives better?